Cuyahoga County, OH is represents a mix of ancient lake-front physiographic regions including the Erie Lake Plain (083a), Mosquito Creek/Pymatuming Lowlands (061b), and the Erie Low Lime Drift Plain (061c). These varied conditions host a wide array of species, sub-species, and naturally-occurring varieties. Use the below list to select species for restoration projects, plantings in city and county parks, and general landscaping uses. Not all plants are suitable for every location. Consult a local naturalist/ecologist or contact ArcheWild for specific recommendations, particularly if you are planting near the shore. Avoid using cultivars whenever possible. 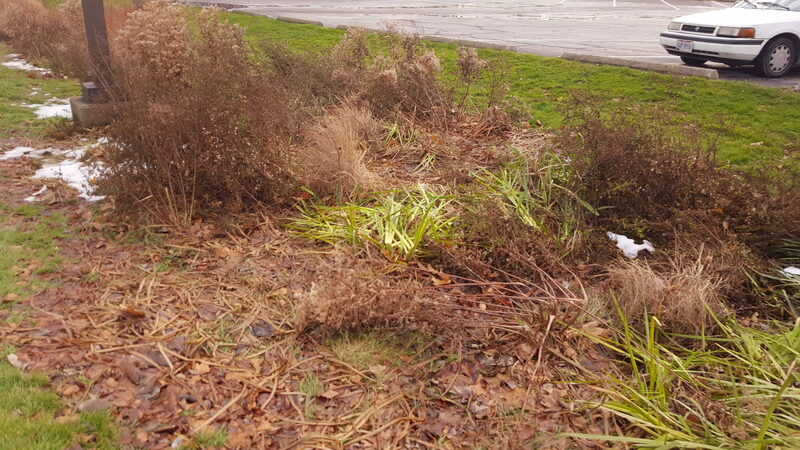 Scroll down to see pictures and read descriptions of three different struggling planting projects in Cuyahoga County. 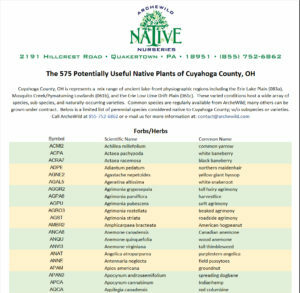 Click the list image below to download a PDF of a limited set of perennial species considered native to Cuyahoga County; subspecies or varieties are not included. Opens in a new window. Contact ArcheWild for a custom list or a complete list of species considered native to Cuyahoga County. Common species are regularly available from ArcheWild; many others can be grown under contract. When ordering from a native plant nursery, request genetics originating from the EcoRegion that your project is located within. Use our lookup tool to determine your EcoRegion. The impetus for this post was a number of three struggling plantings in Wildwood Park, at the mouth of Euclid Creek. This planting on a high sandy dune near the shore uses red-osier dogwood (a mountain swamp species), a little bluestem cultivar (an inland species), and bluestar (a wet meadow species). These species are inappropriate for the site, look ragged, and are unlikely to survive. 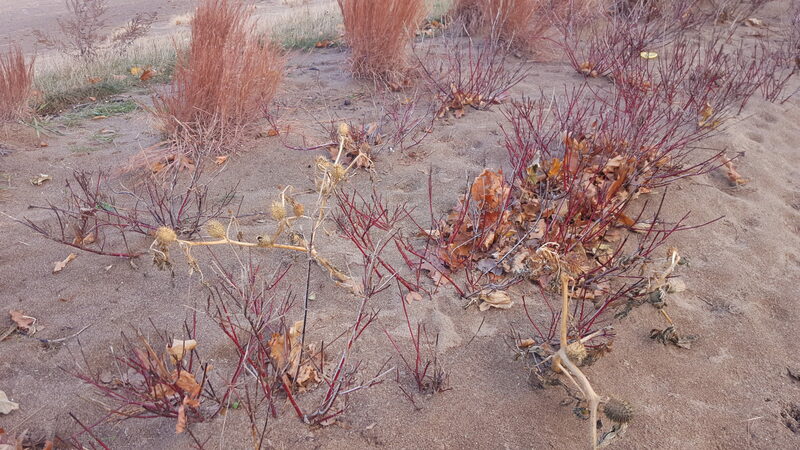 Better selections would have been local genotypes of big bluestem, wafer ash, and bayberry. 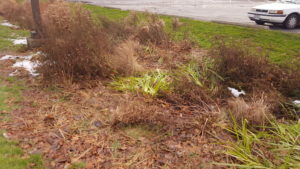 This bioswale in the parking lot experiences long periods of saturated conditions in the winter (as shown) and periods of drought in the summer. 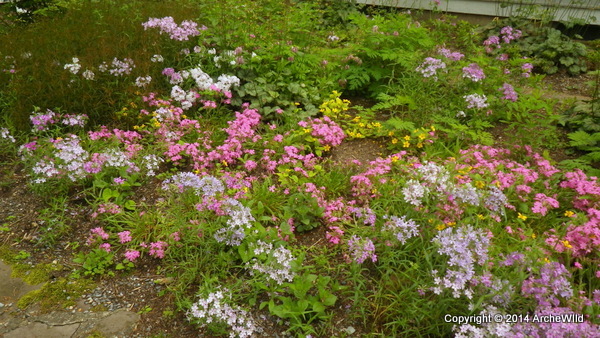 The soils are not native but landscaper-grade fill. The poor soil and challenging conditions make species selection particularly challenging. The little bluestem is drowning, the blueflag iris lacks the consistent moisture it requires so it looks anemic and floppy, and the Canada goldenrod looks too weedy in this application. 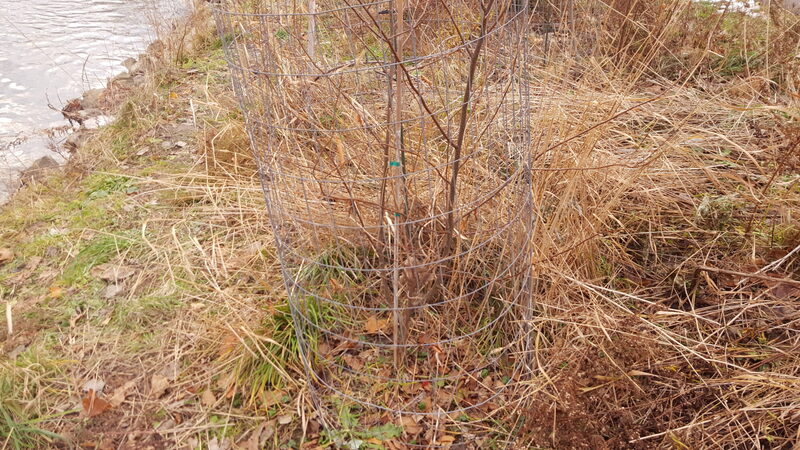 Better choices might have been cutleaf coneflower, silky dogwood, and beebalm, all of which can withstand the bioswale conditions. This riparian restoration features broad patches of switch grass, which is working, but technically not appropriate for stream banks. A selection of trees were planted along the shoreline of the Euclid but many are unsuitable for the location. Note the multiple trunks and uneven branching of the tree in the picture. This a sure sign of soils that are too heavy for the species. More suitable choices could have been sycamore, sliver maple, and basswood.